In a few days, another decade comes to a close. Can you remember what happened 10 years ago? The Dow Jones Industrial Average closed above the 10,000 mark for the first time. (This year, we were all happy that it reached that mark again!) It then proceeded to reach 11,000 less than two months later. The strongest tornado ever recorded in world history slammed into Moore, Oklahoma. George W. Bush announced that he would seek the Republican Party nomination for President. The world population reached 6 billion. (We’re now nearly at 6.7 billion!) And as 1999 came to a close, the world sat on pins and needles, wondering if Y2K was going to wreak havoc. (source: Wikipedia) My, how things have changed. 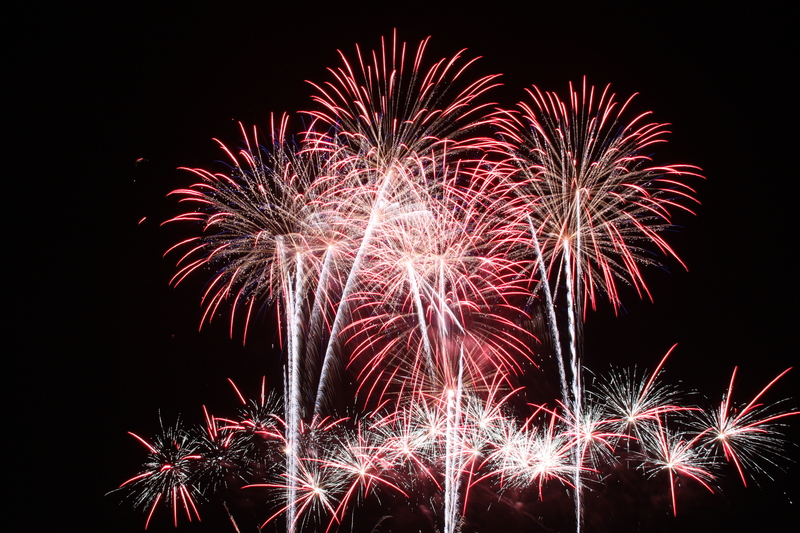 With the arrival of 2010, there are so many things to celebrate. Personally, I am so thankful that our family has fared well during this time of economic crisis. I am thankful that my family is healthy. In this past year, we lost family members near and dear to our hearts, but I am thankful that we enjoyed many wonderful years together. I look forward to the next year, and the next decade, as there are many wonderful things to come. In the spirit of the New Year, I want to share with you all the top 10 successes of Tasty Eats At Home for 2009. These are the ten most popular recipes on Tasty Eats At Home. A few are prior to my gluten-free days – but upon realizing their success, I now wish to make plans to convert them to gluten-free and re-post them in the coming year. That way, everyone can enjoy them! 1. Vegetarian Bean and Pumpkin Chili, plus a Gluten-Free Cheddar Serrano Biscuit – This is a delicious and easy recipe. I love that it requires little active cooking time, it’s healthy, and it’s comforting. Oh, and of course, delicious! 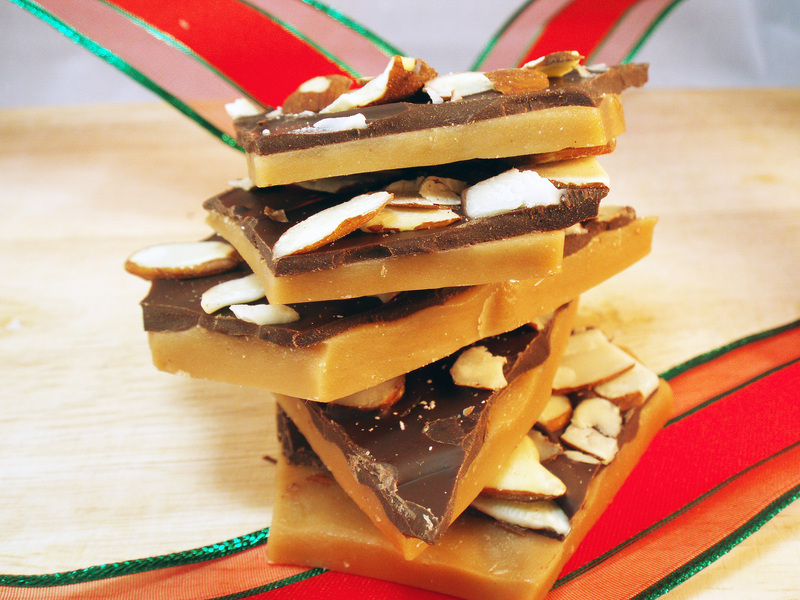 I plan on making another batch this week! 2. Korean Short Ribs Tacos – This was one of my favorite recipes to make! Ever since I learned of Kogi BBQ, I dreamed of the flavors in their tacos – salty, spicy, sweet, tangy – and I couldn’t stop thinking about them until I made this dish! I still have no idea if the recipe is close to the original, as I haven’t ventured to Los Angeles, nor has Kogi BBQ arrived in Dallas, but who cares? These tacos are so tasty, they’re craveable. 3. Thai Curry Pumpkin Soup and Gluten-Free Chive Biscuits – Is it a sign that more than one of my top recipes is vegetarian and healthy? 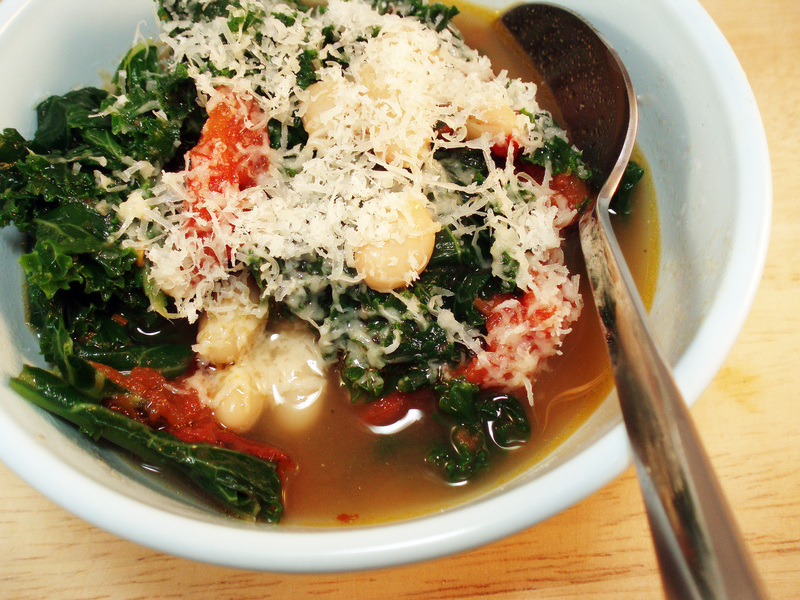 I loved this soup, and have made it several times. It’s easy, and it’s hard to mess up. It also makes a perfect first course dish. 4. The Best Brownies in the World – These babies aren’t gluten-free as written. But I’ll let you in on a little secret – if you substitute rice flour for the regular flour, and add about a teaspoon of xanthan gum, you’d never know the difference. There isn’t much flour in the original recipe to begin with, so the texture doesn’t change much when converting it to gluten-free. I’ll definitely re-make and re-post these gluten-free soon. They’re so worth it. 5. Make-Ahead (Gluten-Free) Turkey Gravy and Stuffing – I can see how this is a favorite. When you have food intolerances, often times you miss those comforting foods you can no longer have, especially around the holidays. This recipe makes it possible to enjoy those favorites again. I’m definitely going back to this year after year for Thanksgiving. 6. Spiced Pear Jam – This reminds me – I wish I would have canned more jams, jellies, and pickles this past summer. It wasn’t all that difficult, and I love that I have a few jars left to enjoy through the winter. Definitely doing this again next summer! 7. Nopalitos con Huevos – This recipe was posted pre-gluten-free. Gluten-free chorizo can be found, but it’s not always easy. I have found that Whole Foods makes a gluten-free chorizo; they sell it at the meat counter. It’s quite tasty too. If you substitute a spicy breakfast sausage, this dish would still be delicious. 8. Chipotle Pork Tinga Tacos – Rick Bayless, how I love him. This recipe comes from his book Mexican Everyday, and is absolutely wonderful. I also love that it’s a slow cooker recipe, making my dinner prep a snap. 9. Exploring Texas BBQ – The recipes from this post are numerous, as this was one of my Foodbuzz 24, 24, 24 events. It was probably one of the most fun events too – and what a great way for me to learn to smoke meat! We still talk about the barbacoa – how delicious it was, how incredibly huge that head was, etc. Great event, and I can’t wait until the next warm, lazy weekend, so I can crank up the smoker and create a delicious meal. 10. Turnip Green, Bean and Cheese Empanadas – Another vegetarian recipe, although this one isn’t gluten-free as written. No worries, though – I loved these so much, I’m determined to come up with a suitable gluten-free empanada dough to substitute. After all, there’s nothing quite as wonderful as a hand-held pocket of veggie and cheesy goodness! Stay tuned! Are there any favorites that you have that didn’t make the list? What would you love to see on Tasty Eats At Home in 2010? Of course, my New Year’s post wouldn’t be complete without resolutions. Apparently, posting my resolutions here forces me to focus on them. I have managed to achieve most of last year’s resolutions. I still need to work on expanding my knowledge of Indian cuisine, and I need to make a few key Mexican dishes, make sushi, fried chicken, and sausage. We’ll add those to the 2010 list. Here goes – ten Tasty Eats At Home resolutions for 2010! When I read the challenge for Daring Bakers this month, I immediately felt that lump rise in my throat. Gingerbread house? Are you kidding me? 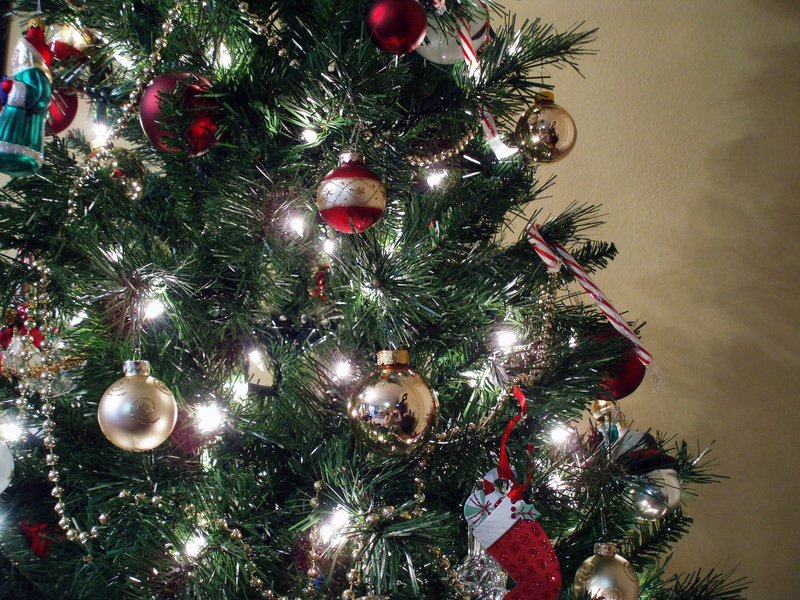 (No offense to Anna of Very Small Anna and Y of Lemon Pi – it’s a wonderfully festive idea!) It just seemed insurmountable. I’d never made a gingerbread house. And this baby had to be gluten-free. Over the next few days, after I had time to digest the challenge and do a little research, I felt ready to tackle it. I looked around and found this pattern. Seemed simple enough to handle. 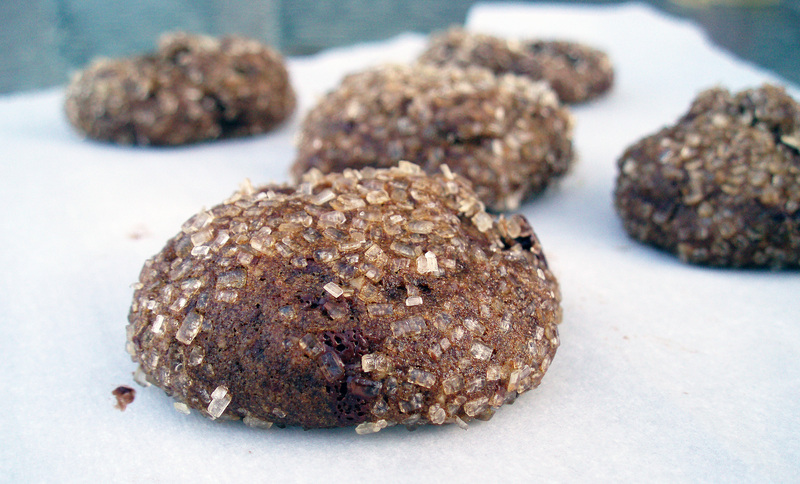 And after researching gluten-free gingerbread, I decided on this recipe. I did choose regular butter instead of the margarine, I used more rice flour instead of the millet flour (I didn’t have millet flour on hand), and I opted to refrigerate the dough for several hours before rolling it out. I was so glad I did, because even rolling it out while chilled proved to be a test of patience. The dough was quite sticky and seemed to absorb a lot of rice flour – I kept dusting my board and rolling pin over and over, only to roll it out and have my cut pieces stick. When they didn’t stick, they came off of the board misshapen and I’d have to start over. It took me a while, but I did successfully roll and cut out two houses’ worth. Thankfully I had extras. Once baked, they did warp a bit. No issues – I got out my knife and made cuts to make them fit. Easy peasy, or so I thought. I broke some pieces – and ended up with just enough pieces for one house. But they still didn’t fit together perfectly. All in all, the house was a success – even if the sides didn’t fit together. (I’m so thankful for royal icing – it’ll stick any of those big gaps together!) 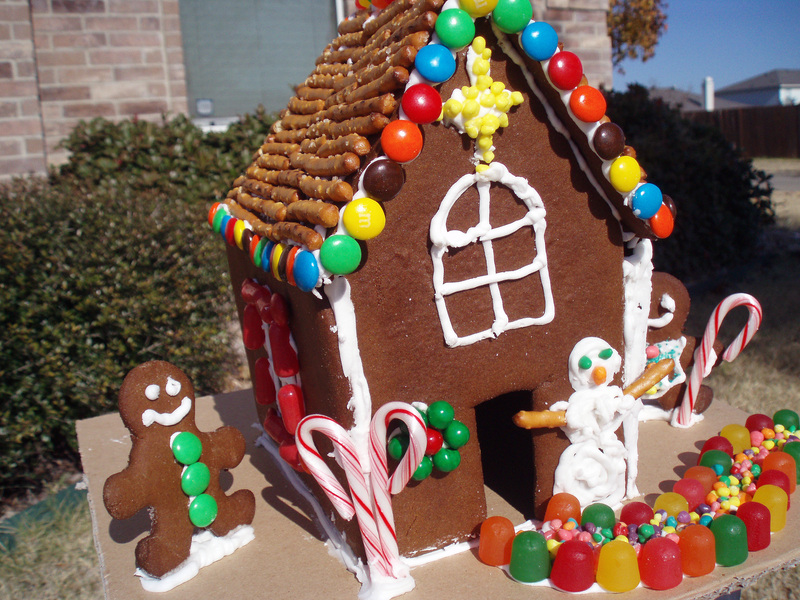 I chose gluten-free candies (Dots, M&Ms, Sixlets, Hot Tamales, and Nerds) to decorate, and used Glutino pretzels for the roof. I wasn’t perfectly happy with it – but it was finished. The following day, my parents stopped by and I tried to show it off gain some sympathetic approval, and my husband mentioned to them that he’d never heard so many curse words come from the kitchen as when I was working on that house. Whoops. Guess my secret’s out! What would I do differently next time? I might find a different recipe for the dough – but I have also since seen that there are molds for gingerbread houses. I think if I was to make one again, I’d definitely find some of these. Maybe that’s cheating, not sure! I just know it was quite an undertaking for me to finish this house! All in all, I’m glad I participated in this challenge. Going beyond my comfort zone – that’s what it’s all about, right? They were free this time around. Free to choose which meal of the day to prepare. Free to choose what they wished to make. So of course, Brittany immediately chose something with an insane amount of chocolate. As any 11-year-old girl would, I suppose! She wanted to make chocolate pancakes. But not just that. She wanted chocolate chips in the pancakes, and to sandwich the pancakes with a layer of peanut butter. And top with more chocolate chips. I knew I had to find a way to make this breakfast just a touch healthier than it would seem. But I had to be sneaky. These were supposed to be fun pancakes, after all! So I turned to my two friends – coconut flour and agave nectar. I love using coconut flour in baked goods – it’s gluten-free, lower in carbohydrates, and high in fiber. It also seems to create fluffier, lighter baked goods than some other gluten-free flours – always a good thing when we’re talking pancakes. Agave nectar has less of an impact to blood sugar levels than sugar – an added bonus for you when you’re serving a sweet treat to kids – no crazy, out-of-control, hyped-up-on-sugar children! These weren’t health food by any means, but I did feel a bit better knowing I was making a few tweaks for the better. These pancakes were pretty tasty – just the right amount of chocolate, and they were very filling. And for once, all of the kids enjoyed the meal! (If I haven’t told you before, I live in a house with some picky eaters.) I say that means these are definitely a keeper. Beat egg whites until soft peaks form. Separately, beat egg yolks until foamy. Fold together, along with melted butter, milk, agave nectar, salt, and vanilla. Whisk in coconut flour, cocoa powder and baking powder. Stir in chocolate chips. Heat a nonstick pan to medium heat. Spoon 1/4 cup of batter onto the pan. Allow to cook for 3 minutes or so and carefully flip. Allow to cook for 2-3 minutes more or until cooked through. Repeat with remaining batter. 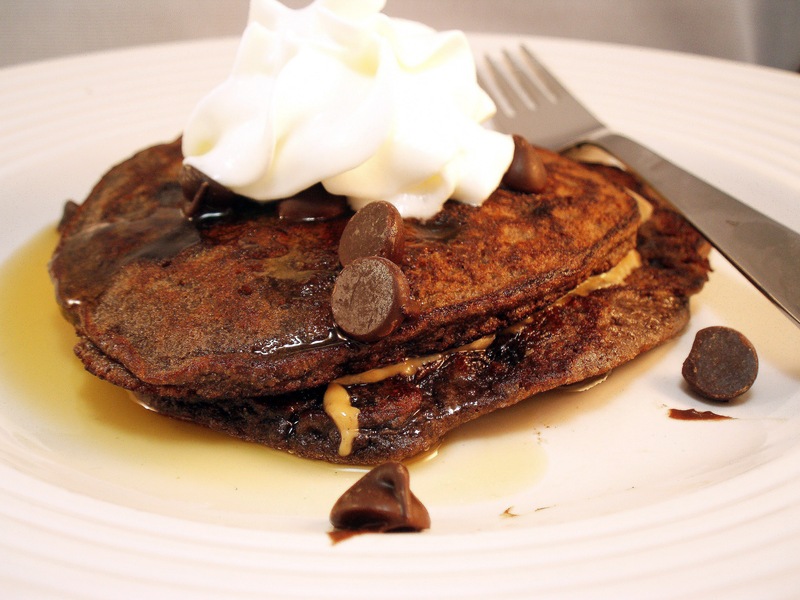 Serve with toppings such as peanut butter, maple syrup, and whipped cream, and top with additional chocolate chips. Makes about 9 pancakes. And I took the plunge. What “plunge”, might you ask? I joined the Daring Kitchen and became an Official Daring Cook and Daring Baker! For those of you who are not aware, individuals can choose to become Daring Cooks or Bakers to challenge themselves to learn new techniques and recipes in the kitchen. Each month, one of the Official Daring Cooks/Bakers chooses a recipe, and all of the other Daring Cooks/Bakers join in the “challenge” by making that same recipe. It’s a wonderful way to step outside your comfort zone. And if you cook or bake gluten-free (like me! ), sometimes it forces you to step WAY outside that comfort zone! This month’s Daring Cooks challenge was chosen by Simone at JungleFrog Cooking. 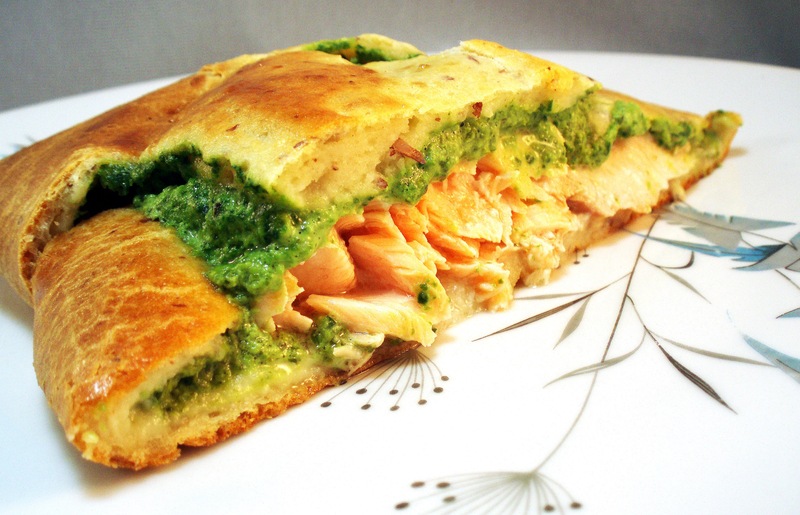 The challenge was to make salmon en croute – following a recipe from Good Food Online. Of course, I would have to find a gluten-free version of a shortcrust pastry. Unfortunately, there is not an abundance of gluten-free shortcrust pastry recipes out there. I chose one from The Cook and The Chef, using Pamela’s Baking and Pancake mix for the gluten-free flour blend. I also used spinach, rather than watercress or arugula/rocket, as this was what the grocery had in stock. As you can see from the photos, my crust was not perfect. It was quite “wet” and so it was a bit of an exercise in patience to wrap the salmon in the dough. It also slid a bit while in the oven and left cracks, in spite of my attempt to cut slits to allow steam to escape. But if you look really carefully, you can see that I did successfully cut a star shape out of the dough to place over my seam in the middle of the pastry. But in spite of the less-than-perfect aesthetics, the dish was quite tasty. The salmon was so perfectly moist and flavorful, and even my spinach-fearing husband went back for seconds. 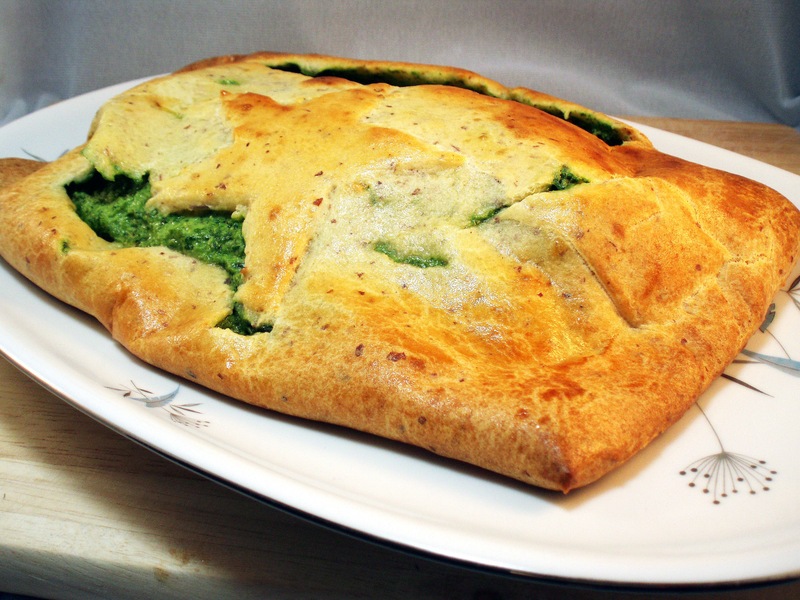 I think that if I was to make this dish again (and I plan to), I’d search for a different shortcrust pastry – one that is a bit drier – but all-in-all, I’d consider my first Daring Cooks challenge mostly successful. I think once I have the pastry down, this would be an excellent dish for company! This time of year, decadence reigns. Buttery, cheesy, rich – these are flavors welcomed in December. Chocolate-dipped, whipped cream-topped, caramel-filled? It’s the holidays; why not? And of course, only the prettiest and most elegant will do – perfectly shaped cookies and pretty cakes adorn most food blogs right now. Not that I’m pointing fingers; after all, I posted the most decadent hot chocolate ever just a few days ago, and I have plans to start baking cookies very soon – after I can stop drooling over others’ holiday recipes and narrow down my own “to do” baking list! But there are many days in December that aren’t holidays. Many of the days in December we are rushing about and stressed, struggling to balance the preparation for celebrations in addition to our daily duties. Those days call for easy meals that still warm the soul and nourish our bodies. Those meals don’t have to be decadent (in fact, it’s best for our health if they aren’t! ), and they don’t have to be fancy. Sometimes, simple and rustic is best. A lentil and sausage stew can be perfect for such a day. I haven’t found many lentil recipes that I’ve truly been in love with. Yes, they’re healthy, full of fiber, a good source of protein; but most of the times, I’ve been on the fence about lentils. Apparently, I just haven’t looked hard enough. 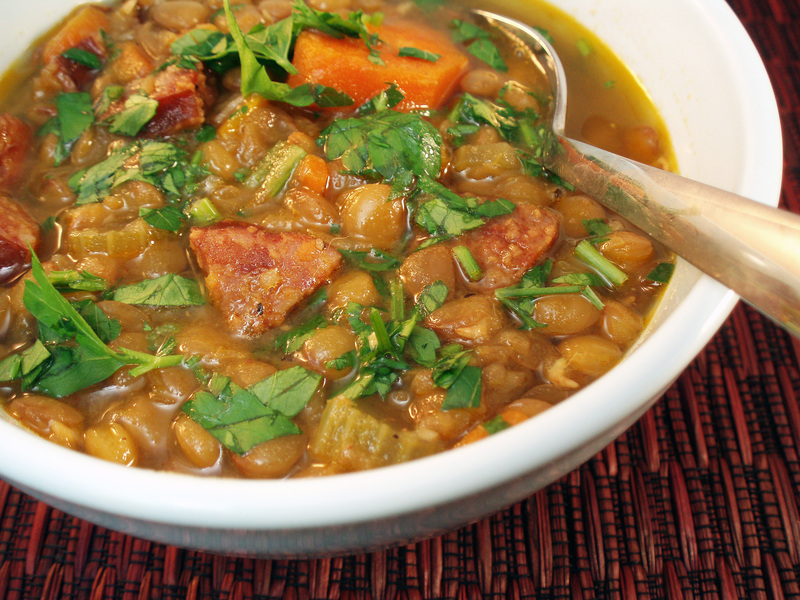 This stew changed my mind about lentils – the flavor is so big and bold in this stew that I couldn’t help but enjoy a rather large bowl. The jalapeno sausage brought just a hint of heat to the broth, but the vegetables and parsley truly brightened the flavors, and the smoked paprika added an additional depth. This was a stew I could make again and again. Which reminds me, I still have some left over. Lunch tomorrow? I think so! In a large pot, add oil and bring to medium heat. Add smoked sausage and brown, 4-5 minutes. Remove, leaving as much of the oil in the pot as possible. Add onion, carrots, and celery, and sauté until tender, 7-8 minutes. Add garlic and thyme and sauté another minute. Add sherry and scrape up any brown bits at the bottom of the pot. Then add broth, water, lentils, and seasonings and bring to a boil. Add sausage and carrots and reduce to a simmer. Allow to simmer partially covered for 30-45 minutes, or until lentils and vegetables are tender. Stir in spinach and parsley and serve.